My knee-jerk reaction was to write about the negative (below). It's what stuck. Then I thought, "You know what, they don't deserve all that time and energy. I'm going to write the positive thing, too, damn it!" So I am. Prompt be damned. Negative: "You talk too much." When I was a kid, one of my aunts, my dad, and a couple other family members used to tell me regularly that I talked too much. It always shut me right up. It always humiliated me. It always hurt my feelings. But they didn't care about the latter two outcomes, just the former. It affected me forever. Now, I don't talk about myself unless I'm asked a direct question. I'll ask questions, I listen to what others have to say, and I'll discuss all of that, but I won't offer up anything about me unless it's pried out of me. As such, I don't have many people who know me well (or as well as they think they do). I once had a wonderful conversation with a friend, but upon reflection later on in the evening, I worried that I had talked too much. I immediately wrote to her to apologize for monopolizing the conversation, for talking too much about myself. Her response was, "Huh, that's weird, I thought it was a really good talk. I enjoyed it!" I don't have a good barometer for such things and it's a direct result of being told this over and over in my youth. Kids listen. Kids internalize. 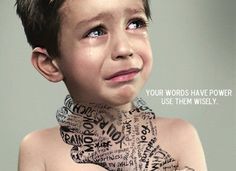 Kids are affected by what you say and do to them. Kids deserve better than your negativity. Positive: "If you can sing like that, why do you teach?" When I was a kid, I said I wanted voice lessons. I was laughed at. I never asked again. It wasn't until I was in my mid-twenties that I got up the nerve to bust out some karaoke. Even then, I was terrified of being judged, being laughed at. Turns out, though, I was good. I am good. Unless I was in a huge crowd of strangers, virtually anonymous, I still never sang in front of anyone. Nobody I knew ever heard me sing. Ever. Thanks to a little liquid courage at a end-of-the-school-year party, though, I busted out a song in front of my coworkers one night. My boss, a man who used to call me a "natural teacher," approached me afterward with a stunned, but serious look on his face and asked, "If you can sing like that, why do you teach? I mean, seriously!" I'm a good teacher. I'm a really good teacher. I know it and he told me so. So, for him to say that was a touching compliment that I've never forgotten.